Studies involving mice have proven that cigarette smoke suppresses a protein that causes the natural death of mucus-producing cells in the airways of bronchitis patients. The study, published in the Journal of Respiratory and Critical Care Medicine, examined both human airway tissue samples and mouse models. 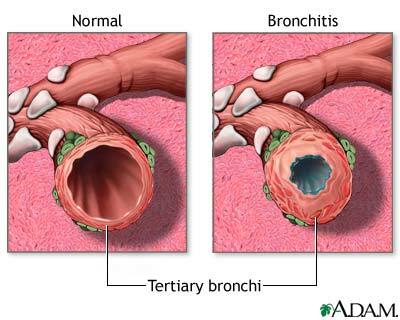 Human samples were derived from autopsy tissues and from bronchial brushings taken from individuals with chronic bronchitis as well as healthy controls. Mice were exposed to cigarette smoke for 6 hours per day, five days per week for three weeks. Following exposure, lung tissue samples were collected and examined. The researchers said the findings showed that the airway cells that secrete mucus are sustained by cigarette smoke, which suppresses a cell death-inducing protein called "Bik". Mice exposed to cigarette smoking also had significantly reduced Bik levels and increased numbers of mucus-producing cells. The researchers hope to use these findings "...to investigate therapies that may restore expression of Bik and reduce the numbers of mucus-producing cells," which "...may reduce excess secretion of mucus and the airway blockages in patients with chronic bronchitis."